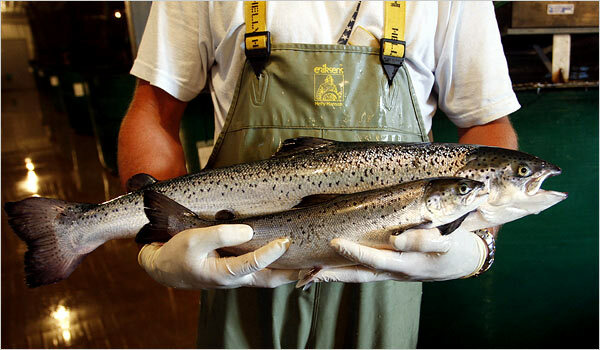 FrankenSalmon – Genetically modified for whom? It’s a good question. Who benefits from genetically modified salmon? Well for one, the company producing it does. This fish in the back is genetically modified. The one in the front is a non-genetically engineered salmon of the same kind. Financially, this would reduce the cost of farmed salmon. And two, I suppose it would reduce the cost of farmed salmon in the supermarket. That, however, is not a viable reason to genetically modify salmon because I never recommend people buy farmed salmon in the first place. There has been a debate recently about the safety and use of genetically farmed salmon. These salmon have been genetically modified to grow bigger and faster yet require 10% less food. It’s called the AquAdvantage salmon. It has genes inserted in it from its close cousin the Chinook salmon and from something called the pout fish. The combination of this genetically engineered animal allows it to grow faster, larger and year round instead of just the warmer months. This is a biggie. These salmon are not natural but they are farmed in natural environments. They are farmed in the open ocean in huge nets that allow them to swim freely, more or less. What happens when one escapes? Millions of fish that are farmed in this manner escape every year. They are sure to escape and because they are bigger and faster they will out compete the truly wild fish for everything from mates to food. Then we will have genetically modified fish and non-genetically modified fish mixed together. Why is this a problem? Because the native salmon populations are already in danger and anything that could possibly eliminate them is a serious threat. This qualifies. It’s also problematic because our salmon population will no longer be pure. No one can predict how nature will react and this is walking a dangerous line. 2. Is it safe to eat? At this point, this is a question that remains unanswered. I can say this though – an animal is born with a natural genetic code. It has evolved over millions of years to operate best with that genetic code. Changing that genetic code is potentially dangerous and could possibly have unknown consequences. Genetic codes do change, that we know. However, they do not change overnight as is the case with this new salmon. They change over thousands of years and generation after generation is allowed to adapt. We cannot possibly know what kind of impact allowing a fish to grow twice as fast will have on the quality of the meat or how it will affect it on a molecular level. What if this rapid growth causes the production of an unwanted chemical within the muscle of these new fish? What if that chemical, unknown to us, is dangerous the human health? The possibility is there and it is dangerous. 3. Will you know you are eating this FrankenSalmon? Should it be allowed for sale in the US, you will not be able to tell what kind of salmon you are eating. 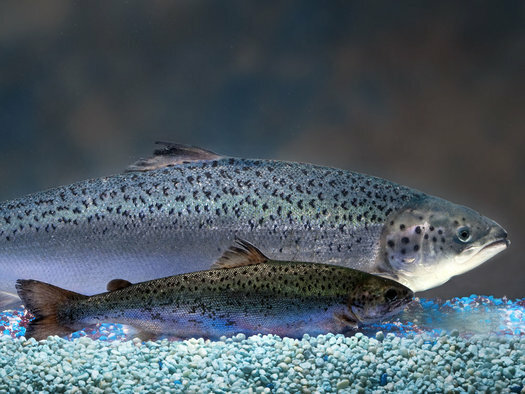 Because the FDA says the genetically engineered salmon is not substantially different from regular salmon, AquaBounty wouldn’t be required to label it as genetically engineered. This leaves us with basically no choice. You could of course only consume wild salmon and you would be safe. I always recommend this, but I am also a realist and know that it’s not always possible to get wild salmon everywhere you go. This salmon will be farmed in Panama and currently it would be the only salmon farmed in Panama so under current labeling laws it would have to state that. This may be another way to tell if it is genetically modified. Unless something is done to make sure that genetically modified salmon are labeled as so, I fear people will be consuming them without knowing it and without a real choice in the matter. These fish are actually siblings. The one in the front is not genetically modified, but the one in the back is. Genetically engineering food is a slippery slope. It opens up the proverbial can of worms. Putting these fish into our food supply is a dangerous act and could lead to problems down the road in the environment and in human health. At this point we simply do not know enough to safely put this into our diets. Much more research and time needs to be dedicated to finding out whether this is safe for long term human consumption. I’m a little confused at the controversy here. For hundreds of years now our farmers have been deliberately creating hybrids of both plants and animals, and we have been consuming those products just fine. Just to clarify what this means: We take a random 50% of the genetic contribution from each of two different species that can’t or don’t reproduce with each other, and force that to happen. Then we eat the result, and it is good. There are countless examples of fruits and veggies that have gone this route. See: pluots for a great example. Many hybrid farm animals have been created by the forced mating of cousin species with each other. mules for example are horses mated with donkeys, which doesn’t typically happen in nature. So the big question is: Why is *that* ok with everyone? Why is it okay to have 50% of the genes added to the offspring be completely random with no idea what specific genes are going into it, But its *not* okay to take 3 specific genes that are well studied, documented, natural variants of genes already present in the host organism? I think your argument holds water. Indeed, people have been combining genetics for centuries in an attempt to make plants or animals larger, faster, better tasting, what have you. My issue, however, is that it has been under the watchful eye of nature and evolution. The laws of evolution would suggest that if you combine two plants, for example, that should not be combined the offspring would not survive or would not be able to reproduce. By allowing nature to combine these two entities we leave what we are doing to biology and evolution and things that should not combine won’t. By doing this in a lab we force our plans into nature. It may work 99.99% of the time that way and be very safe. However, what if the .01% that goes wrong goes very wrong and something gets out of control? In my opinion it sets a dangerous precedent. I believe we should leave genetic recombination to evolution and nature. I think you might be misinterpreting “the rules of nature and evolution” a bit. Evolution only states that a trait that is favorable against environmental constraints continues, and ones that aren’t get weeded out. this is very different from the every day understanding of “survival of the fittest”. Evolution doesn’t particularly care what is happening to make an organism selectable as long as it is selected. The plight of the pluots is supported by this and goes against your “nature wouldn’t allow this argument”. For whatever reason the two component species went separate ways eons ago due to environmental pressures we’ll never know or understand. today plums and apricots can’t and do not reproduce with each other naturally. Once created, pluot trees don’t / can’t seek each other out selectively in nature either, and thus must be made by humans manually or they would die out. This is not a “natural” thing by your rules of nature and evolution, and is a clear example of us forcing our plans into nature, and nature trying to undo it. But, nature (and my belly) doesn’t seem particularly agitated by this. What has in fact happened is a new environmental pressure/selector has been put in place that selects for that combination and keeps it continuing. that pressure being man, and that pressure will eventually make or break this new species existence. Whats important to reiterate here is that 50% of something was randomly added w/o any kind of control to something else, and yet everyone who has eaten one remained alive and well afterwords. given your concern about “what happens .01% of the time”, which in reality given that we are talking about a genome swap of a total of 3 genes or approximately 0.000001% is a 50,000,000% less likely approach to keeping from producing something that “could go horribly wrong”. Simply said, that means that either things go horribly wrong all the time, or they really never go that terribly wrong and its generally ok.
Now, after that long winded breakdown, I will say that we should be *very* concerned when scientists start fabricating their own genes from scratch and introducing those to our food supply. That is something that only tens to hundreds of thousands of generations of trial and error and refinement can do. But that is an extremely long period of time away from being a possibility since at the moment it takes an inordinately long time for even the fastest computers on earth to simulate the folding of even the simplest protein. Chris, great article. I’m with you on this one and appreciate you writing this in a low key manner as not to incite fear or emotion, but presenting the facts and allowing people to make up their own mind. As far as I’m concerned I agree completely that if nature ain’t doing it, it shouldn’t be done! Over 300 million acres are planted to GM corn and soy. In my opinion, it is the illusion of food, and not food. I guess I have to wonder if we are that far from Hitler’s mentality. GM Fruits and Veggies a few years ago, fish today, human beings tomorrow: Super humans? Something to think about. Where does this stop? Thanks. I hope you enjoy reading some of our other posts. I apologize that comment was for the author of the blog post, not to the comment. Thanks.